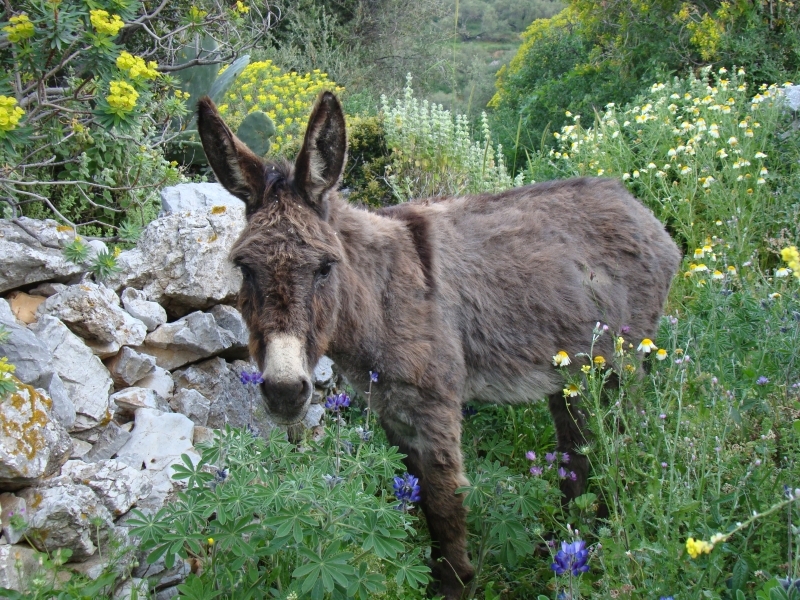 Taking the donkey track between Langada and Tholaria takes you through the village of Stroumbos. The path is very easy and regularly used all year around by locals and visitors alike. There are great views over the bay as you progress along to top of the valley. The village of Stroumbos is known as the village of ’12 houses and 13 ovens’ as each house had its own oven as well as there being an extra oven outside one of the houses. The extra oven was considered to bring good luck to the village and ensure that no one would go hungry. Stroumbos is believed to be on the site of the oldest settlement in Aegiali, however the current houses are only about 300 years old. Whilst being small it was nevertheless a self-contained village with a weaver, cobbler and olive press. After the Second World War the village was slowly abandoned as people either left the island or moved to Langada. Whilst it is not so many years since the houses were abandoned they are in such a state of ruin, with collapsed roofs, due to the owners taking their valuable juniper roof beams with them. Five houses have now been renovated; two are lived in all year round with the others only used in the summer months. To this day Stroumbos has no road, piped water or electricity. Rain is collected into water cisterns and lifted out by well buckets. There is also the ancient spring of Chorio nearby where the water is said to have healing powers. Oil lamps provide light, bottled gas is delivered by donkey to run fridges and cookers. Olive wood is used on open fires or in wood burning stoves to produce heat. Small unobtrusive solar panels provide limited electricity to run small lights and recharge items such as mobile phones. The cache is in a DVD box in a plastic bag. It just contains a log and a geocaching declaration in Greek and in English. Please take a pen with you.